Have you noticed it is getting light earlier every morning? Fantastic. Now is the time to shake off Winter and kick start your fitness routine in earnest. Whatever exercise routine you have, try to think about adopting a skincare routine to compliment it. Here’s a few tips to keep yourself and your skin look great whatever the season. To protect yourself you need to find a great moisturiser for your face. You would think that for the best protection you should use the thickest product available. Not true. It’s not the viscosity of the product that makes it work, it is the level of active ingredients. The most important thing is to find a moisturiser that really penetrates and hydrates the skin. It should be light, quickly absorbed and, as you are a guy, matifying. 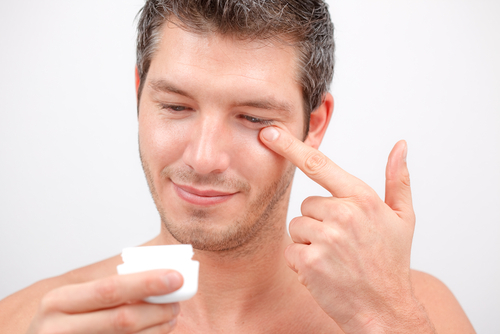 The next area you should think about protecting is the delicate skin around your eyes. It is the first place to show signs of fatigue and ageing and there are loads of products out there specifically formulated for your under eye bags and dark circles. A product that protects, refreshes and repairs, as well as moisturises is a good place to start and the best ones contain cucumber extract, hyaluronic acid and peptides. When our lips become dry, particularly in cold weather, we tend to repetitively lick them to restore the moisture. Even though licking your lips may, for a few seconds, make them feel better, it actually makes lips dry out even more as the moisture evaporates from them. This can easily lead to painful, cracked, sore lips. You should try your best to not lick your lips when they begin to feel dry, instead you should use a quality lip balm or lip serum. There are some very clever formulations currently available that don’t use petrochemicals, so don’t have the awful lip balm taste and as an added bonus they are taste and shine free too. So no one will know you are wearing them. Extreme temperatures and winds can also affect hair by drying it out. So in the winter months we recommend conditioning it 3 – 4 times a week instead of the usual once in warmer months. Use with a high quality conditioner alongside a quality shampoo and if they both feature caffeine all the better. And last and by no means least use a sunscreen. A sunscreen? Winter sun, combined with snow glare can still damage your skin. And mositurisers with added SPF usually offer such low protection that they may lure the wearer into a false sense of security when it comes to sun protection. So we recommend using a dedicated sun screen on top of your daily mosituriser or serum. You should apply a high factor broad-spectrum sunscreen to your face and your hands and reapply frequently if you stay outside a long time, are working outside or are playing sport. If you follow these few easy tips you should cruise through Winter into Spring looking great as you do it.